And still they come. The last opera I saw during my near-year of liberation from Poundland was La bohème at the Deutsche Oper. No year goes by without multiple opportunities to see it; few years now go by without my taking at least one of those opportunities. Indeed, I see that I shall now have gone to Jonathan Miller’s staging on three of its five (!) outings since it was first seen at ENO in 2009. Is there a degree of overkill, especially when it comes to a far from adventurous production? Perhaps, although I am well aware of the (alleged) reasons for a company performing the opera so frequently. Do they add up, though? Judging by the number of empty seats at the Coliseum on this, the first night, I am not sure that they do. Might that indicate that it is time to give the work a rest or a new production? Again, perhaps, although what in the present climate would be an adequate substitute for box-office certainty? Perhaps there is no longer any such thing. Is that a bad thing? For a company struggling with declining funding and years of mismanagement – remember the self-styled ‘She-E-O’, Cressida Pollock, granting interviews about how she liked to relax with a bottle of wine whilst wearing her favourite training shoes, at the same time as attempting to sack the chorus? – the answer would seem to be yes. On the other hand, might it ultimately be a prod towards diversity of repertoire, towards taking Puccini as something more artistically serious than a box-office certainty, towards asking whether a performance in an often jarring English translation vaguely ‘after’ Giuseppe Giacosa and Luigi Illica is really the best way to ‘sell’ as well as to perform this work to a multicultural audience? Perhaps. We shall see. 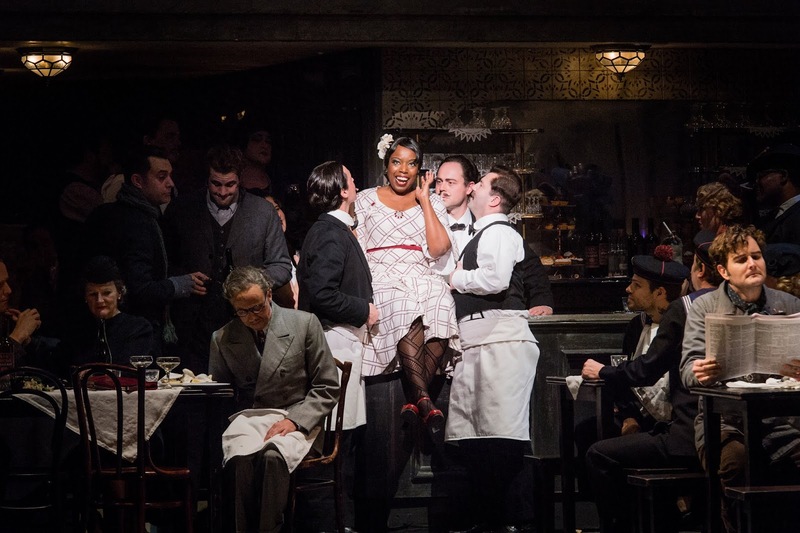 One very welcome aspect of this performance – and possible justification for retaining the production a little while longer – was the opportunity it granted, well grasped indeed, to a young cast including two of ENO’s Harewood Artists: Nadine Benjamin and Božidar Smiljanić. 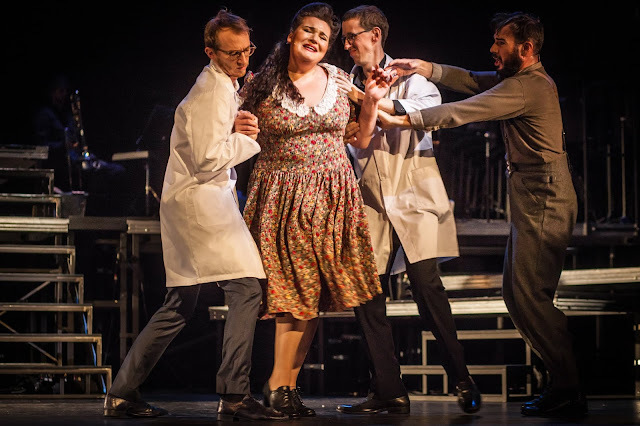 Benjamin’s Musetta is very much her own woman, no mere memory of other Musettas we have heard – or claim to have heard (‘does not efface post-war memories of Dame Ermintrude Heckmondthwike, “Ermie” we called her…’). Not that she was different for the sake of it, quite the contrary, the crucial facets of Musetta’s character coming through bright and clear, but fresh too, very much an acquaintance as well as a reacquaintaince – and a vocal acquaintance too. Smiljanić is likewise an able actor and impressed greatly both as soloist, insofar as possible for a Schaunard, and in ensemble. 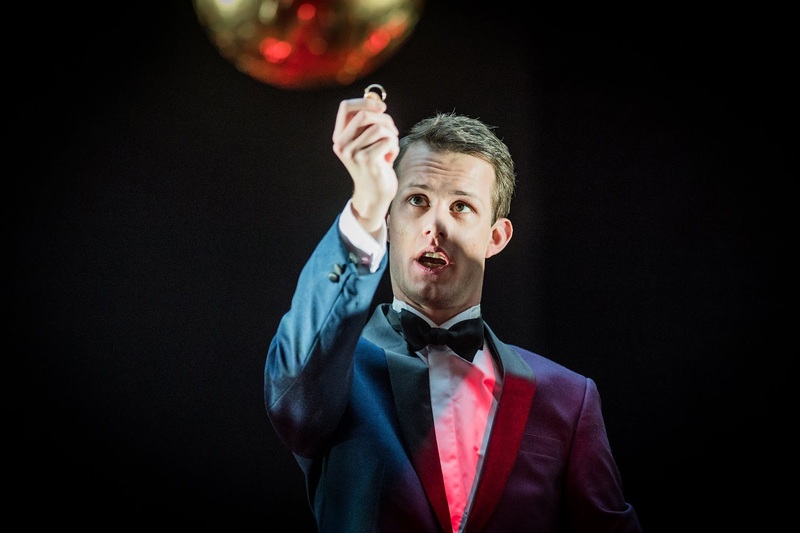 Likewise David Soar as Colline, his final-act moment something truly to savour. 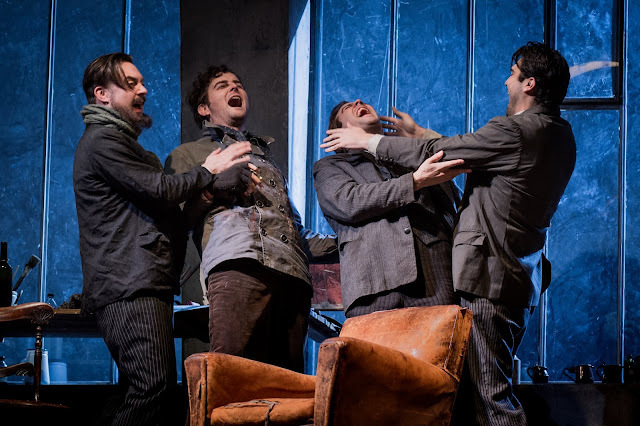 Nicholas Lester’s Marcello was definitely a cut above the average, rich and, where appropriate, ardent of tone, hinting cleverly at far more to the character than we ever officially learn (surely so much of the trick to a compelling Puccini performance). Simon Butteriss’s comedic turns as Benoît and Alcindoro even had a doubter such as I consider the approach (Miller’s, I suspect, more than the artist’s) perfectly justified. Last yet anything but least, our pair of star-crossed lovers, played by Jonathan Tetelman and Natalya Romaniw, showed themselves (mostly) sensitive artists who could yet project to the back of the largest of theatres. (Alas, the Coliseum remains not the least of ENO’s problems, whatever audience members ‘of a certain age’ might claim.) Romaniw’s Mimì proved perhaps the more moving early on, but that is more likely a consequence of the opera itself than of any great performative disparity; both certainly moved in the final tragedy of the work’s final minutes. If only they had not on occasion – under instruction, I suspect – played to the gallery, treating their ‘big moments’ as stand-alone arias. The real culprit here, I think, was Alexander Joel. His conducting of the ever-excellent ENO Orchestra was incisive and mostly unsentimental, but he seemed incapable of thinking – or at least projecting – a greater unity to each act, let alone to the score as a whole. Of Puccini’s ‘symphonism’, we heard little or nothing. 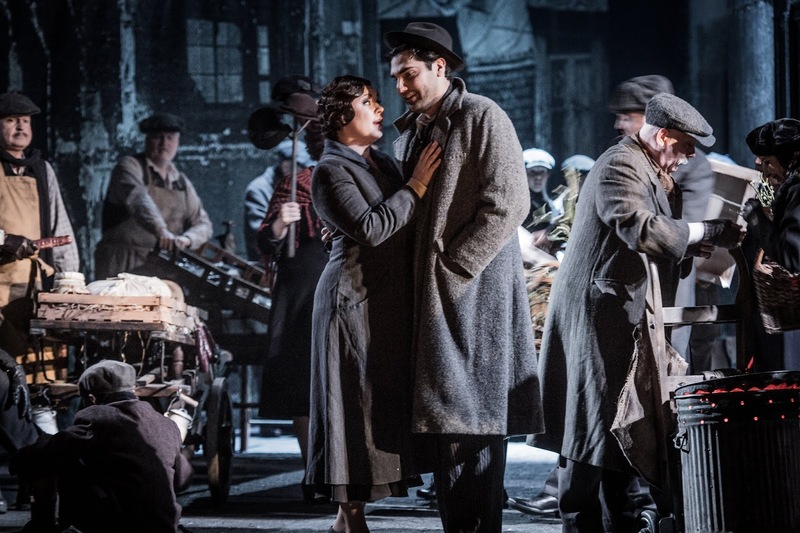 As for Miller’s production, ably revived by Natascha Metherell – who surely deserved a curtain call – it is what it is. Paris updated to the thirties looks beautiful, occasionally desperate too; Personenregie is keen. As mentioned above, I am more reconciled to its comedy than I first was. Moreover, I rather like – some do not – the glimpses we catch of characters off the set as such, carrying on with their lives. Something a little challenging or interesting, though, would surely not go amiss in the future. 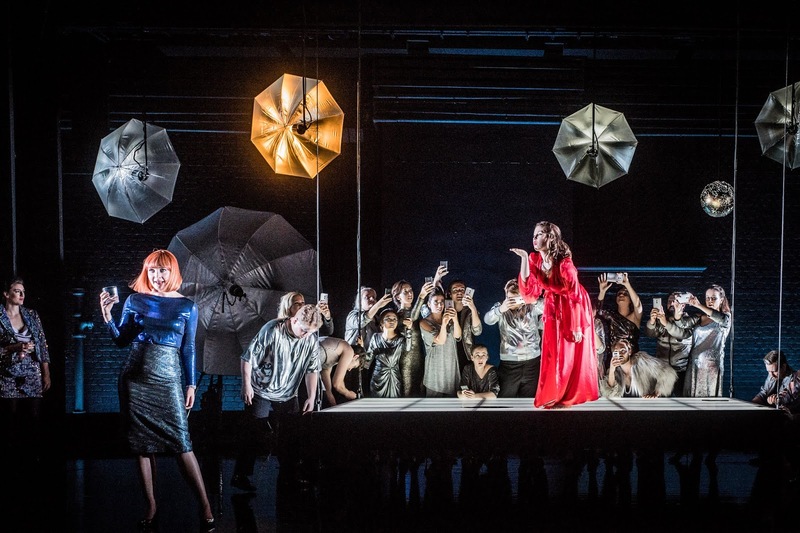 As yet, few if any directors seem to have matched Stefan Herheim’s challenge in his superlative Norwegian Opera production, let alone gone beyond it. Will time tell? Perhaps. It is rarely anything but a joy to hear the Hagen Quartet, especially when it comes to the central Austro-German repertoire. This Wigmore Hall concert of works by Schubert, Webern, and Haydn proved no exception. Schubert’s G minor Quartet, D 173, opened the programme. Its first movement proceeded with a ‘rightness’ very much setting the tone for the rest of the concert. Well judged, without a hint of complacency, it offered formal dynamism with due flexibility – and a sense of G minor as a key, as a key with tradition, in the line of Mozart. Lyricism and turbulence were equal partners, Schubert’s often underestimated – even by him – skill with counterpoint their midwife. The Andantino smiled through tears, fragile without sentimentality, the Hagens’ playing as cultivated as the Vienna Philharmonic under Karl Böhm. Hushed passages drew one in, above all harmonically, with a simplicity that wanted to be Mozart’s yet, with the pathos of distance, could not quite reach him. Such, after all, is Schubert. The minuet proved very much an heir to its counterpart in the ‘Little’ G minor Symphony, distance and affinity again equally remarkable, as too they were in the post-Mozartian trio. Similarly posed between precursors and the Romantic future, the finale’s aesthetic drama unfolded before our ears as if for the first time. The two following works received some of the finest Webern playing I have been privileged to hear. In the Five Movements, op.9, the first movement alone conveyed a full sense of the most concentrated sonata form: not merely structure, but form, experienced in time, in performance. Crucially, it danced too, old Vienna still with us; so too did it sing, unmistakeably in Schubert’s line. Dramatically necessary after that, the second, slow movement seemed more immediately of Schoenberg’s school. Every note – and so much more than every mere note – told. An instrumental scena, Webern’s Erwartung: that was how the central movement, marked ‘Sehr bewegt’, came into our consciousness. Likewise its successor: how every interval spoke to us, possessed of a meaning seemingly beyond the ability of words to communicate. Such listening seemed in retrospect to have prepared us for the final movement, albeit here at least as much vertically as horizontally: Webern’s music might as well have been serial all along. And how much music there is here to play and to listen. Those op.5 Movements seemed on the verge of expansive when compared with the concision of the op.9 Six Bagatelles. There was no mistaking, though, the common voice, the composer unquestionably the same, although the material was entirely different and sounded as such. The first sounded very much as a first movement in the line of Schubert or indeed Haydn, whilst the second brought a world transformed as its bracing wind blew. Terror or passion in the third? Why choose? Webern did not, nor did the Hagen Quartet. A similar refusal to indulge in the either/or characterised the fourth piece, a song of torment, consolation, and so much else. Connections between every note sounded all the more intense, all the more necessary as we reached the fifth and sixth bagatelles, both movements with character of their own, the latter every inch a finale in both style and dramatic necessity. With Haydn’s B-flat major Quartet, op.55 no.3, we immediately heard the composer in full maturity. Times on the clock may have been different, but everything counted just as it had in Webern. Who needs a stage when all the musical world is a stage of the mind and senses already? Who needs a vocal quartet, when the instruments can sing and converse like this? Such interplay between ‘characters’, already marked in the first movement, seemed momentarily exchanged for something more ecclesiastical, even sacred, at the beginning of the second. Haydn, though, is never to be pigeon-holed, musical drama between those two tendencies, broadly defined, being revealed as its musical secret, equipoise almost Mozartian – without ever quite sounding ‘like’ the work of the younger composer, and rightly so. The minuet took nothing for granted, emerging all the more strongly for it. There were perhaps greater swing and vigour than I might have expected: again, the Hagens’ performance was one truly to draw one in. The trio followed on and contrasted, just as one might have hoped, if again never quite as one expected. With Haydn and with a great performance of Haydn, one must listen, truly listen. That holds, if anything, still more so for his finales; at any rate, it certainly did so here. Beethoven, Bartók, and many others, Schubert and Webern amongst them, would surely have doffed their hats at such riotous invention. I certainly did. Teaching is one of my greatest joys. Without wishing to take anything away from my students' achievements - they are theirs and theirs alone - I cannot help but take a good deal of pride in them. I was recently fortunate to co-supervise (with my Royal Holloway colleague, Dr Shzr Ee Tan) Dr Annabelle's Lee excellent thesis analysing social media marketing in the classical music industry. Annabelle has recently launched a new series of podcasts called 'Talking Classical'. Once again I found myself fortunate, this time to be her first interviewee, discussing my work in music criticism. Please click here for Annabelle's blog and here for a direct link to that podcast on Soundcloud. What a year it has been for Karlheinz Stockhausen. The ninety-year-old composer from Sirius seems in this, the year of his ninetieth birthday celebrations, to be as strongly with us as ever. Berlin’s annual Musikfest did him proud with four concerts, three of which I was privileged to attend. (See here and here for reviews.) 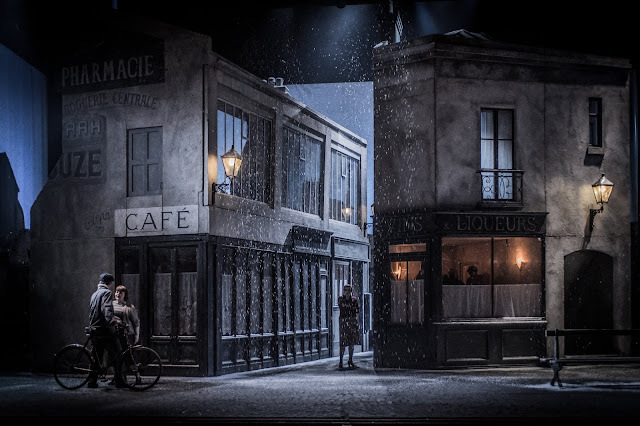 The Paris-based orchestra Le Balcon has, under the direction of Maxime Pascal, launched a series of his complete Licht operas, starting here with the French premiere of Donnerstag in a co-production between the Opéra Comique, Le Balcon, and the Opéra national de Bordeaux. It is planned to reach its conclusion in 2024. 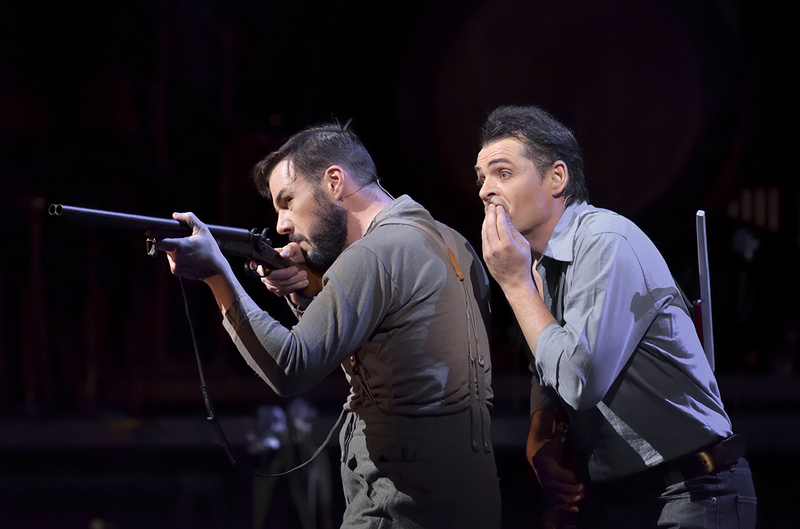 On the evidence of this performance – and indeed of Benjamin Lazar’s production – it will, from beginning to end, prove an absolute must for anyone with a remotely serious interest in opera. Donnerstag may come fourth in the seven days of creation – and thus be expected take that place in a full ‘cycle’, if we must use the confusing, circular term. It was written first, though (give or take a single scene from Dienstag) and to my mind benefits – at the very least, is done no harm – from being placed first like this. At the opening of the treatment of Licht in his book on Stockhausen’s music, Robin Maconie writes: ‘As the first completed opera of LICHT, the day in which, drawing on his own life experiences, the composer lays out his philosophical agenda for the entire week, Donnerstag aus LICHT is at once the most personal in its declarations and the most troubling and controversial in its ethical and spiritual implications. In as much as the opera has a theme, the theme is Kindheit: education, upbringing, self-determination, and spiritual growth.’ Much of that came through strongly – in both musical and dramatic fashion. Indeed, as one would expect in so post-Wagnerian a work, the distinction made no sense. What certainly made an impression – ‘sense’ will be in the eyes and ears of the beholders, the listeners – was the overriding idea, modernist (?) fragmentary tendencies notwithstanding, of self-formation, of a Bildung that is, has been, and, doubtless ever shall be both classical and anything but. There was, perhaps, something necessarily didactic to the first act. (I think one may, even should, accept a degree of essentialism when it comes to Stockhausen. Can one really fail to do so in the German tradition of which he is unquestionably part?) So it felt, at any rate, to me. Following our call to observance in a very particular version of ‘Donnerstags-Gruss’, heard throughout the house but faintly, impinging upon our consciousness, almost switching us or our receptivity on, the first act proceeded almost as if it were a director’s metatheatrical intervention, drawing upon the composer’s biography to elucidate. Except, of course, and with every respect to Lazar’s fine work, the director in that sense remained Stockhausen himself. We were free to draw whatever lessons we wished – none, I suppose, should we not have wished to do so – from Michael’s experience and education, his navigation of boundaries between his father’s (militaristic yet also theatrical) example and his mother’s (musical, carnal, and also theatrical). Michael’s coming of age, the loss of his mother and brother, was Stockhausen’s but not his: it was, in Orphic tradition, that of music too. In Wagner’s tradition, moreover, it was that of art as opposed to different arts: the Gesamtkunstwerk, if you will, a term often more suited to Wagner’s successors (and indeed to his predecessors’ Romantic aspirations) than to his own dramas and theories. Gesture in the traditional form of dance – as opposed to the broader Wagnerian transformation into staging and/or production – played here and elsewhere not only a crucial role but a role that questions and unifies, just as does singing, just as does instrumental performance. We see, hear, think of, even dream the relationships between these outstanding performers of different types. (Or are they different? Is that but our fragmented fantasy?) When Mondeva, whatever her relationship to mother Eva, showed her talons, sounded her basset horn, yielded to the young Siegfried (sorry, Michael), the hallowed German Romantic forest or memories thereof came back to life – albeit here subtly, without a hint of bad nineteenth- or twentieth-century to them. No wonder, then, he proceeded to pass his exams with flying colours. A musician had been dreamed, formed, made incarnate. The instrumental fantasy of the second act, ‘Michaels Reise um die Erde’, as much perhaps a concerto for orchestra as for solo trumpeter (here the outstanding Henri Deléger), offered in many ways the greatest of contrasts. Having been ‘educated’, were we now to ‘enjoy’ – to tour the world, our worlds, other worlds (dramatic, galactic, etc.)? Yes, but not only yes. For the strange rhymes, the peculiar memories and remembrances, of the first act had formed us. There is nothing random, nothing arbitrary to Stockhausen – no more here in Licht than in any work of so-called ‘total serialism’. The composer’s formulae were doing their work, guiding us, in a total(itarian) way serving very much to remind us of his lineage. Michael’s instrumental companions, antagonists, interlocutors, guided yet liberated by Pascal, by Lazar, and – you have guessed it – by Stockhausen, played games with themselves, with us, dreamed of themselves, of others, most likely of us. For this, whether one likes it or no, is a world of mysticism: a mysticism prepared and finally explicit in the third act, in a ‘return’ that, like all returns, is as much concerned with what is new as with what is old. (‘Sonate, que veux-me tu?’ That, among many other things.) Choirs as celestial as those in Bach, theology as heretical as in Wagner and as unanswerable as in Messiaen (and Bach! ), musical virtuosity, theatrical accomplishment: those and so much more, inviting yet rejecting such easy comparisons, recreated a world we both knew and did not. And, of course, they (re-)invited in our constant companion(s), Luzifer – again, of song, of instrument (trombone), of dance. There was victory, but at what cost? There were rejoicing and certainty – again, at what cost? This was the very stuff of drama as much as of ritual, of fantasy as much as of truth, of heroic dissent as much as harmonious union. Stockhausen was reborn both our eyes and ears. I have, I confess, grown a little impatient with armchair listeners continuing to peddle the hackneyed line that the Stockhausen of Licht onwards demonstrated a sad, megalomaniacal decline, whilst acknowledging when pressed that they have never actually attended a performance of the Licht operas. There may be good reason for their not having done so; it does not, however, follow that such critics can possibly in a position to dismiss the works. No more than any other opera – rather less than many in the so-called ‘repertoire’ – should any of these works be considered as a ‘purely musical’ work. It may or may not be revealing simply to listen, simply to read the score. To give these extraordinary works a proper chance, though, one must engage theatrically with them. In turn, we need (excellent) performances and stagings to do so. For that, and for much else, we should be grateful indeed to the Opéra Comique and this intrepid band of artists. No one there will forget this, nor them, in a hurry. Such was not the least of the messages one might have taken, at the close, from the boy Michael learning from his mature selves and the rest of the heavenly cosmos, what the past, present, and future might entail. Enlightenment, Licht as well as Bildung, was seen as well as heard before our eyes, ears, and much else. I have concentrated here far more on the totality, on the overall ‘effect’, rather than on individual contributions; I hope that will not be taken amiss, as a failure to acknowledge their generally outstanding quality. Such was the collegial commitment of all concerned – the audience included, if the wild enthusiasm of its final reception were anything to go by. I have no doubt that it was. Stockhausen, ultimately, tends no more to provoke doubts than Bach. He is what he is – and this was what it was, something quite out of the ordinary. 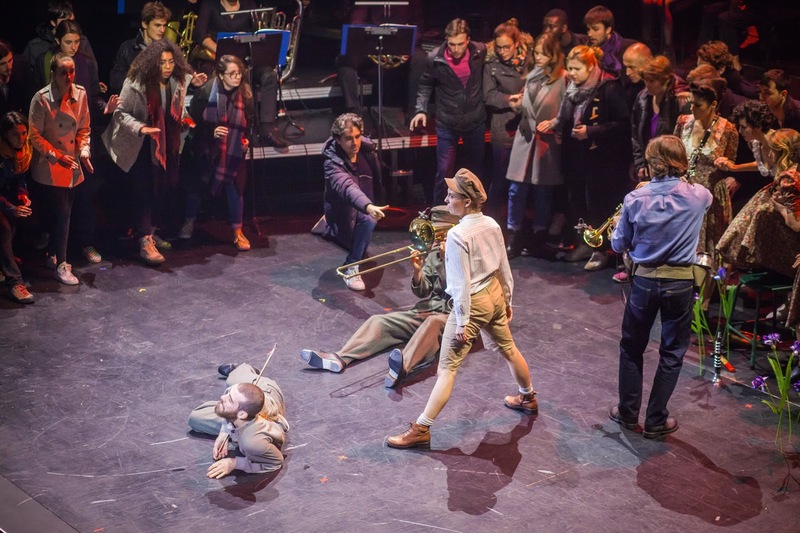 As we retreated into the Place Boieldieu for an 'invisible' musical farewell that spoke or rather sang as much of Gabrieli as new galaxies, that was something we simply, or not so simply, knew. Not entirely unlike the composer into whose cult we had been (re)admitted. 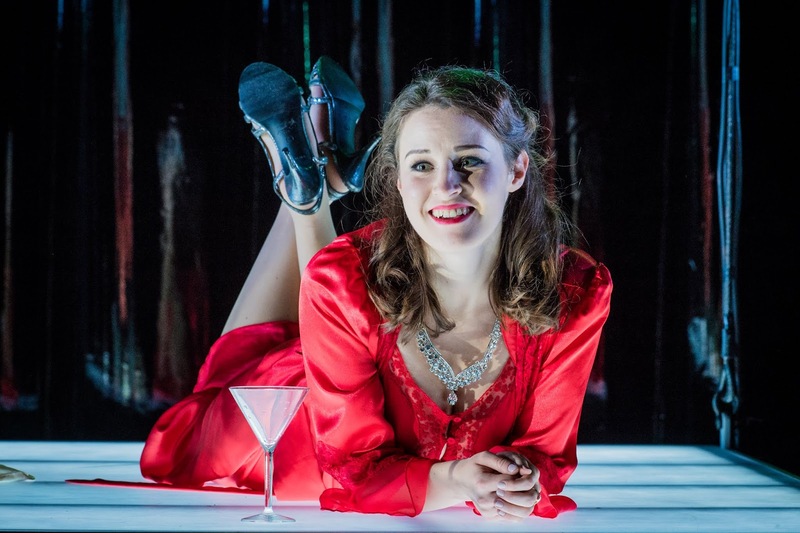 Handel’s Semele was born of and into a celebrity-obsessed society of conspicuous consumption. 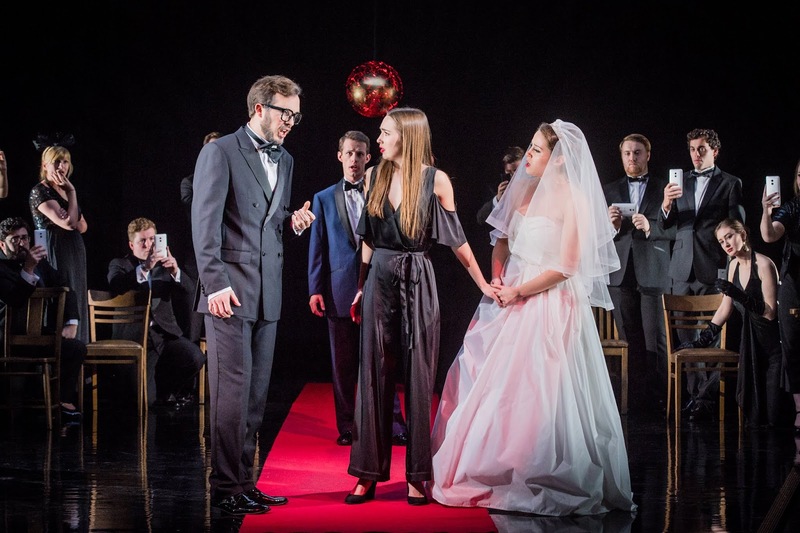 Here, in Olivia Fuchs’s new staging for Royal Academy Opera, it unfolds in one still more so obsessed, still more conspicuously consuming: our own. We can sentimentalise the former, view it through a sepia lens, consider it more ‘beautiful’, but we should be foolish to do so. Fashion ruled there as here. An endless supply of minor portraits – ‘endless pleasure[s]’ – of minor aristocrats might appeal to the ‘heritage’ crowd. Is it, though, anything more than snobbery, snobbery directed from the Brexit generation toward the young, to consider Instagram and its visual network of ‘celebrity’ so very differently? Consequent constructions of the individual and the social come across strongly here. 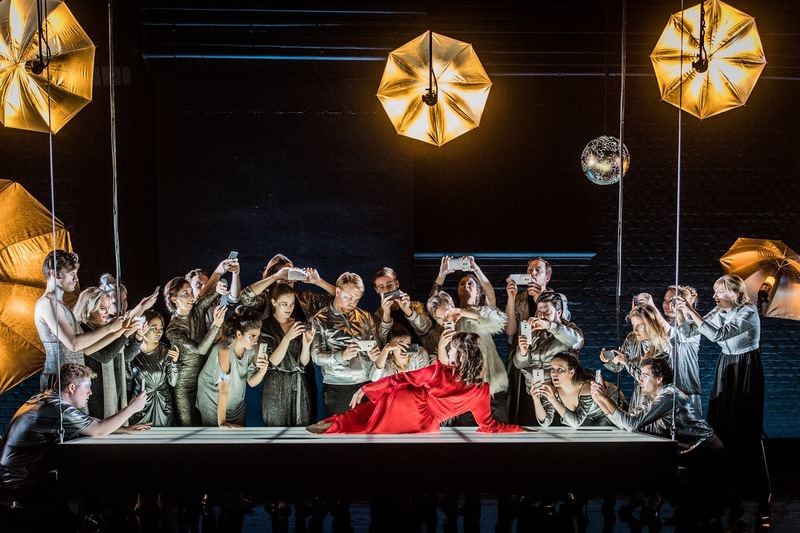 The chorus’s individual and corporate wielding of mobile telephones in the first scene, awaiting the (never-to-happen) wedding of Semele to Athamas, ‘society’ anxious not to miss the opportunity to record every single image of the forthcoming nuptials, might seem a now tedious cliché of contemporary operatic staging. If I am honest, it did so to me too. I came to realise, though, that that was surely the point. It is on the back of such behaviour, such vapid, glitzy, priorities that Semele achieves her moment in the celebrity – divine – firmament. She goes too far, of course, urged on by Juno. Such people tend to: here today, gone tomorrow. In a nice touch, moreover, Jupiter, come to her as ‘himself’, as thunderbolt, not only destroys her, but does so in the flash of a photo shoot. Ryan Williams’s versatile tenor took a well-judged Jovian journey from unheeding divine masculinity to genuine tender care, albeit too late. Frances Gregory offered a Juno not to be trifled with, who yet certainly maintained and projected feelings of her own. Olivia Warburton and Alexander Simpson impressed as Ino and Athamas, the latter especially in his final aria, ‘Despair no more shall wound me’. Both judged well the tricky tightrope between earlier seria tendencies and a new world of sentimentalism (in an eighteenth-century sense). Thomas Bennett’s Cadmus and Somnus revealed a more than promisingly sonorous bass. All soloists and the chorus impressed, their musical and dramatic contributions unquestionably greater than the sum of their parts. The Purcellian ‘Oh, terror and astonishment!’ sounded wondrously grave; frippery and not a little splendour fared equally well. My sole disappointment came with certain aspects of Laurence Cummings’s direction of the orchestra. Playing on period instruments, the musicians often sounded as if they would have been happier not. (I certainly should have.) Cummings’s determination not only to eradicate vibrato but, seemingly, phrasing too, led to some deeply unsatisfactory closes to sections and numbers, as well as a good deal of choppiness in between. At times, moreover, he was unable to coordinate pit and stage. A little more modernity, to match what we saw and heard on stage, would not have gone amiss; nor would a tad more charm. For the second of my armistice anniversary concerts, I moved across town from the Royal Festival Hall to the Barbican. Vladimir Jurowski, the London Philharmonic Choir, and the LPO had set the bar high; François-Xavier Roth, the London Symphony Chorus, and the LSO proved more than worthy successors. Again, there was no nationalist sentiment in (aural) sight; instead, we heard another fine, thought-provoking programme, with much to savour in performance too. Ligeti’s Lontano, music from afar, offered an introductory object lesson in listening and thus a lesson in humanity too. What ill ever came of listening? Alas, as we remember the victims of war, we know only too well what ill comes of failing to listen. Infinite subtlety in work, performance, and yes, reception offered a far greater strength to the masculinist posturing of militarism. How much we heard, making us realise how much we often fail to hear. 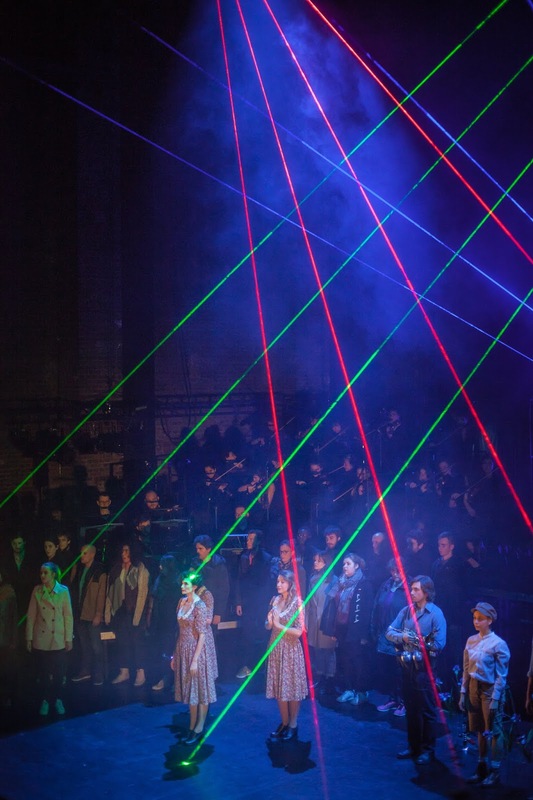 The LSO seemed to act as a chorus of its own, speaking words, messages that we might well fail to understand – and which yet were no less real for that. Final silence at the close truly inspired awe: a lesson for us all, albeit unlikely to be heard by those most in need of hearing it, of listening. For Bartók’s Cantata profana, the LSC, tenor Julien Behr, and bass William Thomas joined Roth and the orchestra. In this particular context, the ballad of an uncomprehending father sending out his nine sons to hunt, those sons thereafter, having been transformed to stags, unable to return home, a grieving mother notwithstanding, took upon resonances perhaps not originally ‘intended’, yet no less real for that. 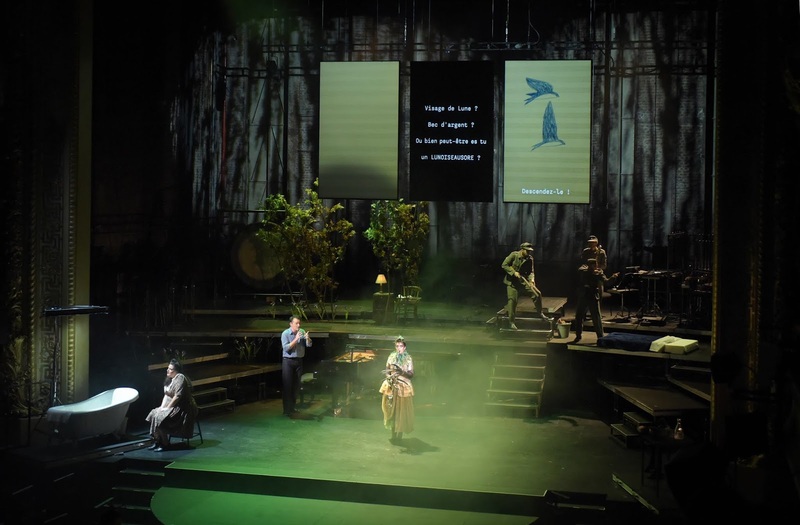 The transformation taking place in words and musical form alike, a story retold, both similar to and yet different from its original telling, invited further resonances both old and new. It certainly did in performances both thoughtful and exciting, in the grip of yet also liberated by musical and verbal narrative. Sinister yet inviting orchestral polyphony at the opening itself seemed to refer to a Bluebeard’s Castle revisited and yet forgotten – perhaps even an earthy successor to Mahler’s Klagende Lied. This was before, let alone after, the entry of the chorus, a world still more primæval. Who narrated? The forest? Humanity? Particular participants? All and none of those, one could imagine at different times, as a magical, fantastical, yet unquestionably ‘real’ narrative unfolded. Multifarious voices, vocal and orchestral, spoke to us, but did we listen? Emboldened by Ligeti’s example, we made the attempt. We were amply rewarded too, whether in Behr’s near faultless handling of the cruel tessitura of his part, in the dark chocolate of Thomas’s performance that yet lacked nothing in precision, or in the outstanding command of the Hungarian text and its musical elucidation from the chorus. 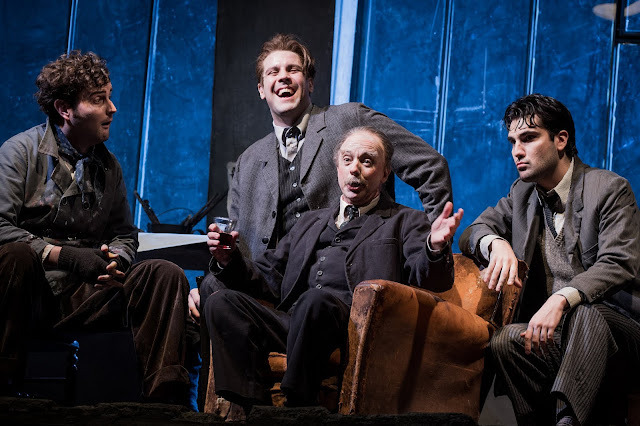 Masculinity showed its tender side here too; the ultimate tragedy nevertheless, quite rightly remained one of incomprehension – even to the extent of knowing whether it were tragedy at all. Haydn’s Missa in angustiis, the so-called ‘Nelson Mass’, offered a different musical and indeed verbal narrative, one which could nonetheless be related to much of what we had previously heard. In its journey from darkness to light, from plea for mercy to divine peace, it offered delight as well as hope, as well, perhaps, as the fear that such might yet remain tantalisingly out of our twenty-first-century reach. The ‘Kyrie’ could hardly have proved more urgent, Camilla Tilling first amongst solo equals, her coloratura duly thrilling. The variegated tone of the LSO here and elsewhere offered a point of contact with Colin Davis’s more ‘traditional’ Haydn with the same orchestra. His way is not Roth’s; nor is there any reason it should be. There was no doubting the integrity of his more ‘period’-influenced approach, which seemed simply to correspond to his understanding of the music rather than to the application of ideology. It outstripped in every respect the meanderings earlier this year of András Schiff with the Orchestra of the Age of Enlightenment in Haydn’s Harmoniemesse, which, whatever their external would-be ‘authenticity’, had shown little engagement with the actual material of the work. Roth’s command of form as dynamic structure was evident from this very first number, the return of the ‘Kyrie’ material as dramatically meaningful as the coming of any symphonic recapitulation. The ‘Gloria’ had, to quote Haydn himself, my heart leaping for joy. Incisive, warm orchestral playing left plenty of room for darkness too. Behr and Christopher Purves offered finely judged responses to Tilling’s lead, mezzo Adèle Charvet’s subsequent ‘Gratius agimus tibi’ a further, properly symphonic development that lacked nothing in beauty of tone. And so it continued, Haydn’s setting our guide, the hallowed liturgical text remaining his – and our – master. If the opening of the ‘Credo’ were taken faster than one –at least I – might have expected, certainly faster than once would have been the case, it was certainly none the worse for that, likewise the ‘Crucifixus’ material. Once again, in the light of Ligeti’s invitation and, indeed, his invention, we seemed to hear so much more than might often be the case: for instance, a string quartet writ large in the ‘Et incarnatus’ section, those terrible sounds of war too, familiar and yet heard anew – just as they should be. There was no doubting Roth’s relish of Haydn’s invention in the vivid setting – depiction? – of the Resurrection, nor the superlative quality of choral singing, from which one might readily have taken dictation. Haydn’s good nature brought tears to the eyes; it could hardly have done so without such excellence of performance. If an armistice remembrance concert is to be held – and surely it is not unreasonable to do so, one hundred years on from 1918 – let it be programmed like this. Yes, official remembrance has, in the very worst sense, been politicised way beyond endurance for most of us in the United Kingdom. What once was more, if never entirely, a remembrance of lives lost, of the evil of war, has, especially since New Labour’s murderous forays into Afghanistan and Iraq, become a totalitarian exhortation to militaristic nationalism. The annual accusatory ordeal of poppy fascism, seemingly receding further and further back in October with every year, should have been abandoned long ago. This, however, had none of that; there was, mercifully, nothing nationalistic to what we heard here. Moreover, if most of the musicians on stage, both in the orchestra and chorus, wore poppies, then it was heartening to see a good few, Vladimir Jurowski included, wearing white. Debussy’s Berceuse héroïque, his ‘heroic lullaby’, as originally conceived, ‘to pay homage to H.M. King Albert I of Belgium and his soldiers’, said much of what needed to be said. 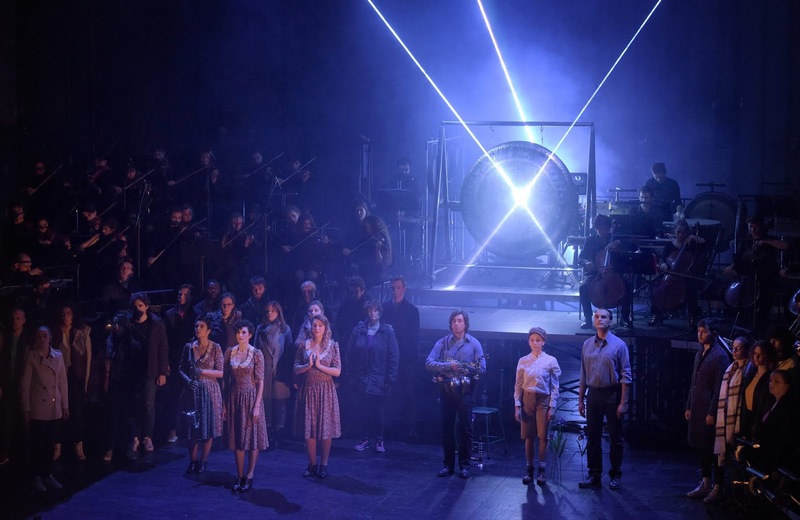 The dark, opening spareness of this London Philharmonic performance sounded as if Debussy, as if we, were remembering the malevolence, the violence, internal and external, of Allemonde, the doomed, fractured society of Pelléas et Mélisande. Maybe of Allemande too: a country about which our ‘musicien français’ showed a distinct lack of wartime understanding. Perhaps Busoni’s earlier Berceuse élégiaque would have proved more universal; perhaps that is partly the point. All of us fall short in our particularities, our proclivities, our prejudices; all of us can do better. 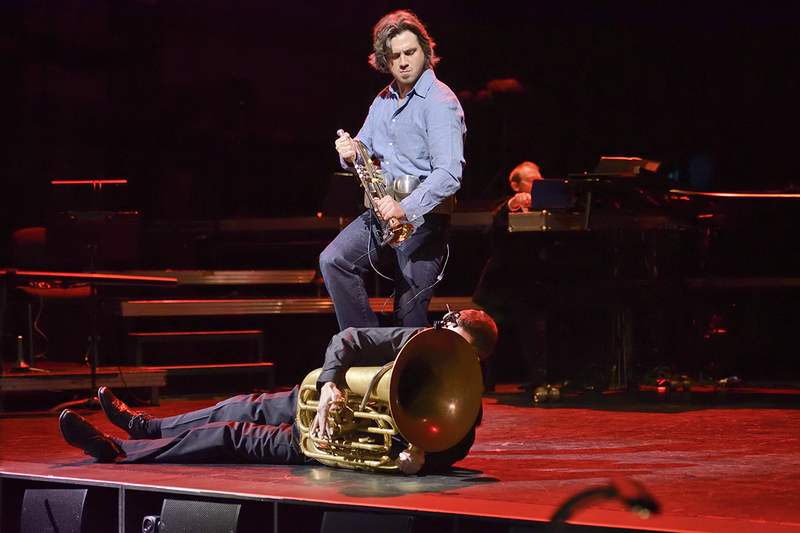 The stifling seduction – nationalism does that too – of the soundworld was poignantly judged in a typically controlled performance from Jurowski that yet lacked nothing in atmosphere or drama. I remain, alas, at a loss to understand what has happened to Magnus Lindberg. Is the composer of Triumf att finnas till… (‘Triumph to exist…’), premiered here, and the Second Violin Concerto, premiered three years ago, really the composer of Kraft? Lindberg’s new choral work sets, in essentially through-composed fashion, seven poems by Edith Södergran. I was delighted to encounter her poetry for the first time earlier this year in Unsuk Chin’s Le Chant des enfants des étoiles. Lindberg, quoted briefly in the programme, speaks admiringly and eloquently of Södergran’s verse and ‘its meditation on the transience of life … [a] defiantly positive affirmation of the joy of existence, the outpouring of one who refuses to submit to the hopelessness all around her.’ For him ‘it says something deeply essential about the tragedy of millions of young men who gave their lives in that useless slaughter.’ I wish I could have thought the same of his setting, which seemed on a first hearing to do little more than, well, set the verse, in a musical language that would have seemed unchallenging at the time of Södergran’s writing. At a pinch, the opening bars might have grown out of Debussy: I noticed in particular the writing for harp. The music, however, quickly grew into something more conventionally ‘late Romantic’. Some of its lush chordal harmonies might have been taken from Szymanowski, albeit without the complexity of texture. The word setting is likewise conventional to a tee, ‘Gloria! Seger!’ sounding just as one might expect. It was probably fun to sing, fun to play even: all quite pleasant. Is that enough? The London Philharmonic Choir, LPO, and Jurowski certainly gave a committed, commanding performance. Another composer long accused of stylistic reversion was Stravinsky. Now, even in most of his neo-Classical works, we tend to hear what unites them with music from elsewhere in his career. Stravinsky always sounds above all like Stravinsky. Perhaps the same will prove true of Lindberg. At any rate, the late serial Stravinsky remains a rare treat, as rare in every sense as the music of Webern, to which it owes so much and from which it nevertheless remains quite distinct. Requiem Canticles I have longed for some time to hear ‘live’; it was unquestionably worth the wait. A smaller orchestra and chorus were joined by mezzo Angharad Lyddon and bass Maxim Mikhailov, all on fine form – even if, very occasionally, an orchestral line sounded on the verge of failing (nothing remotely on the scale of Robert Craft’s feeble performance in the ‘Stravinsky Conducts Stravinsky’ set, though). Rhythm and harmony revealed as great an affinity with the allegedly ‘different’ Stravinsky of The Rake’s Progress of a decade-and-a-half earlier as with other, more expected Stravinskys. The composer’s cellular processes were laid bare, not drily, but with an urgency announced from the off, as the purely orchestral ‘Prelude’ set string serial hounds of hell to their work. How individual the composer’s writing for strings always proves to be; how genuinely different his way of hearing these instruments seems to have been. If the ‘Exaudi’ seemed initially to have stolen a harp from Agon or Movements, the chorus reminded us this was the composer of the austere – until one truly listens – 1940s Mass. Ritual in Stravinsky is sometimes all, but it is ritual imbued with the keenest sense of drama. ‘Tradition’ was reinvented time and time again, in the ‘Dies irae’ – those trombones and timpani – in the ‘Tuba mirum’ – trumpets, trombone, bass, followed by a pair of ineffably Stravinskian bassoons – and beyond. Every interval, just as in Webern, counted. If the ‘Interlude’ offered fearful symmetries both in itself and in the work as a whole, a magic square write large, the ensuing ‘Rex tremendae’ reminded us that this work is, amongst many other things, a musical reliquary, every note a jewel, every silence its setting. Lyddon’s coloratura in the ‘Lacrimosa’ seemed to cast one ear back to Anne Trulove from the Rake, the purgatorial choral chatter of the ‘Libera me’ as startling, as incomparable as anything in the repertory. Its cold terror reminded us, had us remember. The bells of Stravinskian hereafter tolled, more to the point sealed the musical and theological structure, in the ‘Postlude’. This is music we should hear far more often. Finally, joined by soprano Andrea Danková and tenor Vsevolod Grivnov, we heard Janáček’s cantata, Věčné evangelium (‘The Eternal Gospel’). Like Stravinsky, Janáček is almost always unmistakeable, certainly by this stage in his career. Obstinacy of motivic repetition and yet ultimate malleability spoke, even in the orchestral prelude, of Jenůfa and Katya Kabanova. There were times when Jurowski might, perhaps, have exerted less iron control or at least permitted a greater sense of the visionary. By the same token, however, there is much to be said for precision. If Grivnov (Joachim of Fiore) sometimes sounded a little parted, Danková, as the Angel, proved properly of another world. Grivnov’s closing solo in any case turned out to be a duly operatic reflection on what had passed, a mini scena of its own. Is there hope? Was Joachim’s kingdom of love dawning? Can it yet? Who knows? If here the eternal flame did not always quite blaze, flames are like that: often they will flicker. Blaze it certainly did at the close.